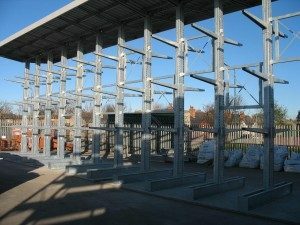 When Frank Key (Nottingham) Ltd a large privately owned independent supplier of building and timber supplies, with over 100 years of history decided to make a major investment into external Cantilever Racking, it was Stakapal that provided the key to the ideal storage solution. At their Bulwell site in Nottingham the company decided to take the opportunity of increasing their range of timber stock, but presentation, storage and selectivity of an expanding product portfolio was fundamental in ensuring that the company’s profile was appropriately raised. Russell Ostrowsky-Weston, The Group Operations Director’s initial approach to Stakapal came about by means of a recommendation. 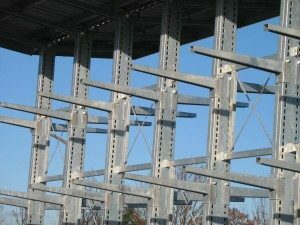 His past experience of Cantilever Racking had been when he had purchased a system manufactured from structural steel sections which within a relatively short period of time had generated high maintenance issues and costs as well as related health and safety implications, not forgetting very poor and awkward adjustability. The location of the Bulwell site on a busy main road and the layout of the yard enabled Stakapal to supply and install a double sided Cantilever Racking system complete with a canopy to predominantly store a range of timber packs from 3000mm up to 4800mm lengths. The position of the racking immediately helped to promote and raise the awareness to any passing trade potential, that Frank-Key were now holding significant stocks of timber.